You can use this guide to teach you how to send and receive Apple Pay cash cards via iMessage (using iOS 11.2 or newer) from your iPad and iPhone. No one needs to deal with the panic of being short paying a bill at a restaurant or fret over how to send money to a loved one so they can buy something special for themselves. Below you will find a quick yet thorough guide to help you do just that. 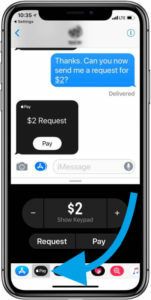 Peer to Peer money transfers are one of the most discussed stock features of iMessage for those using devices with an operating system 11.2 or newer (or watch version 4.2 or newer). In fact you can send up to 3,000 dollars in iMessage through Apple Pay. Currently, this feature is only available in the US. If you live in the US though, you can utilize Apple Pay to send and get money from your friends and family quickly through your messaging app. Now there is no trouble splitting a bill, paying someone back on a loan or even sending a last minute gift to someone you care about. With Apple Pay, it is easy to pay (or get paid) right through iMessage. If you are running iOS 11.2 or newer, follow this guide to sending and receiving money from Apple Pay through iMessage on your iPad or iPhone. ☝REMEMBER: If you do not have Apply Pay set up, you have to set up your account first before you can utilize this feature. Head to Settings, then tap on “Wallet & Apple Pay” and then simply follow the setup wizard. In the setup process for Apple Pay, you will be asked to enter a debit card or choose from an option you might already have stored in your Apple Wallet. The reason you need a debit card is to avoid credit card fees through using services like the one described in this article. You have to toggle Apple Pay Cash on once your card is verified. You will be asked to authenticate with your Face ID or Touch ID to send money. If you have received money through this process, it will be added to your Apple Wallet. You can use it for Apple Pay permissible purchases in stores, apps and in places across the internet. You can choose to transfer this money to your bank account as well, and these are processed by Discover Network and Green Dot. 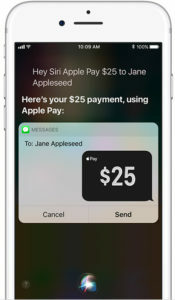 Another cool way that you can access the functionality of Apple Pay Cash is through the use of your virtual assistant Siri. You can simply tell her things like “send $25 to John”. She will want confirmation of your choice, as to be expected. You can use Siri to request money as well. To do this, ask Siri to send money to a contact in the amount you are requesting. You might be asked to select a payment service if you have options like PayPal and others signed in on your device. You can compose a message with Siri to notate that this is a request for funds. You will still have to authenticate using biometrics. It is easy to use this service from your Contacts app, Spotlight, or just the basic Phone app. Use these apps to access a contact’s information and then tap on the dollar sign Apple Pay symbol you see in this profile. Follow the normal steps for sending or requesting money. Authenticate the transaction and you’re done! That is all that you need to know about the Apple Pay Cash process, at least to send and receive money. If you have any trouble or questions about the process, feel free to drop a line in the comment box below and I will be sure to get back with you as quickly as I can .